And it just goes on and on, well beyond when you expect it to stop. Unless you're comfortable scalping within such a low-volatility environment, your best game plan is often to just stand aside until signs of failure. Of course, this then raises the obvious question… is there any way we can anticipate the end of the grind? 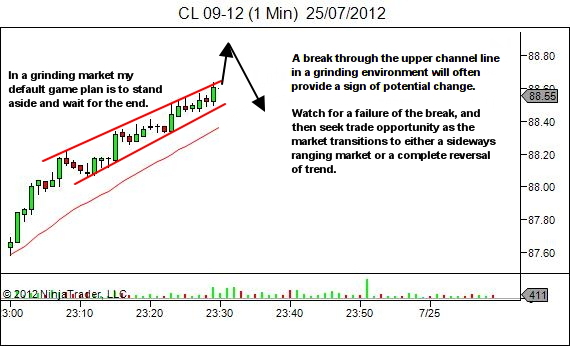 One way is through watching for a climactic break above the upper channel line. To a novice this will look like strength, but like all climactic reversal patterns the failure of the breakout can reveal hidden underlying weakness. The last of the bulls have bought and there is insufficient buying pressure to continue the rally. Note as well that this chart offers a great example of the fact that a "reversal" pattern does not necessarily reverse price. 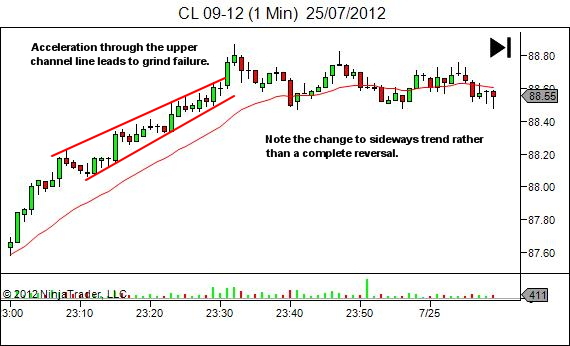 In this case price was simply capped at the climactic break highs, which now formed resistance. Yes, "reversal pattern" is a terrible name. But we're stuck with it as it's become a standard industry term. Always remain aware though of the fact that a reversal pattern is not a guarantee of reversal, but rather just an indication of a change in the supply/demand relationship within the market. It may reverse. It may range sideways. It may just temporarily pause before continuing higher. See also the YTC Newsletter signup bonus ebook, “The LOST Files – 150 Lost YTC Blog Posts” for the following post: “Trading Grind”. This blog post shows a very similar example. You may wish to review it as well.